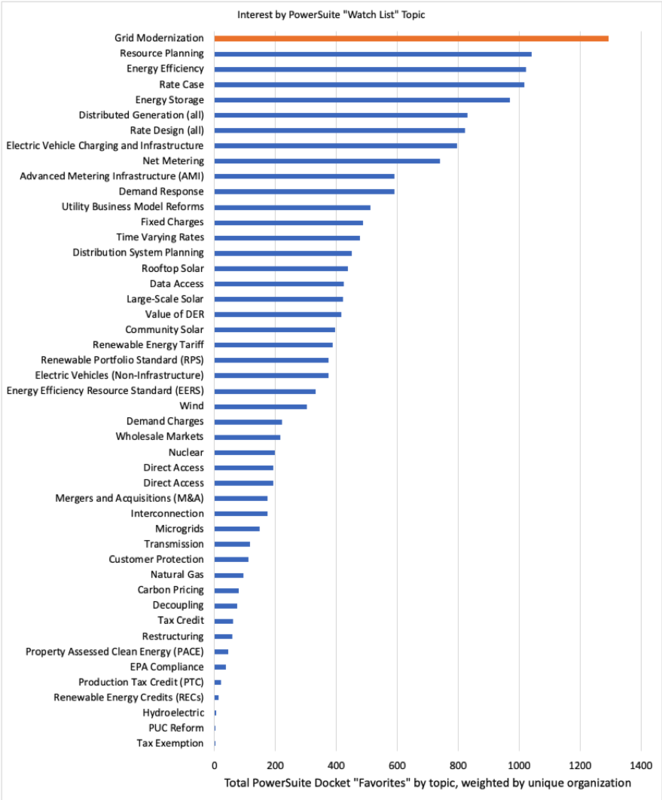 WASHINGTON, D.C., Nov. 29, 2018 – Legislation providing incentives for customer-sited energy storage in California and a utility’s resource plan in Michigan were the top bill and regulatory proceeding, respectively, “trending” in PowerSuite, Advanced Energy Economy’s online tool for identifying and managing energy policy risks and opportunities, in 2018. Among regulatory topics tagged as “favorite” by AEE PowerSuite users, “grid modernization” took top honors with 1,872 tags. In California, the big news in energy legislation was passage of the “100% clean grid” bill, SB 100*. But it was another California bill that was the top trending legislation in PowerSuite nationally all summer long. Passed by the legislature and signed by Gov. Brown, SB 700 reauthorized California’s signature Self Generation Incentive Program (SGIP) for another five years to bring to market new distributed energy technologies, including customer-sited energy storage – and the “trending” status of SB 700 was a function of the burgeoning business interest in energy storage in the Golden State. As in YouTube or Twitter, a bill that’s “trending” in PowerSuite is particularly popular among users and particularly active, in terms of hearings, amendments, and floor action in the legislature. Among Public Utility Commission (PUC) dockets, it was Michigan electric utility Consumers Energy’s integrated resource plan that set the trending pace. 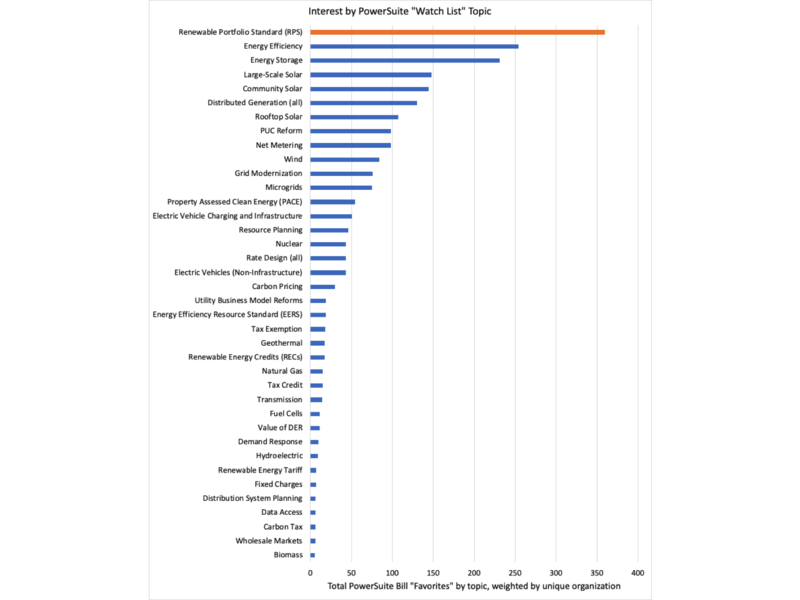 Addressing a wide variety of energy resources – including solar, energy storage, energy efficiency, demand response, and conservation voltage reduction, as well as retirement of four coal-fired power plants – this IRP attracted wide-ranging interest among PowerSuite users in a docket opened in 2015 but with dozens of filings in 2018 alone. Custom Reports: PowerSuite users can share reports on bills or dockets with their colleagues. With one click, PowerSuite can generate a Word document or spreadsheet on the legislation or regulatory proceedings they are following. * Note: Links directly via PowerSuite to docket filing or bill details. Credentialed media have full complimentary access. Contact Monique Hanis at mhanis@aee.net once you establish a trial subscription for permanent access. Advanced Energy Economy (AEE) is a national association of businesses that are making the energy we use secure, clean, and affordable. Advanced energy encompasses a broad range of products and services that constitute the best available technologies for meeting energy needs today and tomorrow. AEE’s mission is to transform public policy to enable rapid growth of advanced energy businesses. AEE and its state and regional partner organizations are active in 27 states across the country, representing more than 1,000 companies and organizations in the advanced energy industry, which employs more than 3.4 million U.S. workers. PowerSuite is AEE’s custom online tool for identifying and managing energy policy risks and opportunities. Learn more at www.aee.net and follow the latest industry news @AEEnet.